So, recently I blogged about my friend Cassie getting married. 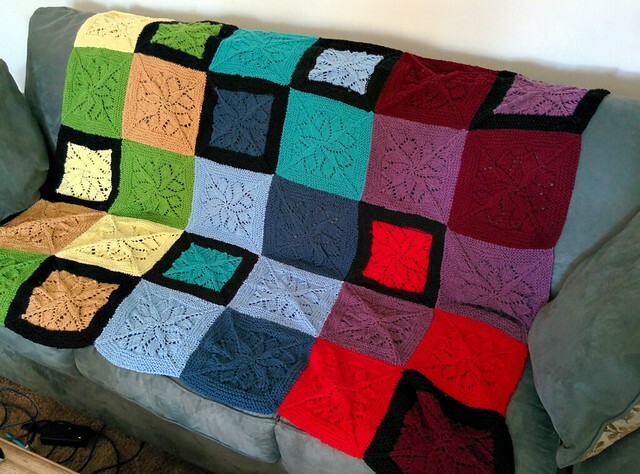 I gave Cassie and Chris a knitted blanket for their wedding gift (I just wanted to make sure I wasn’t spoiling this fact before I wrote this blog post!). It’s my first full-size blanket, and I am so impressed with it I’m not even going to attempt false modesty, OK? Prior to this I knit a baby blanket, which was a much smaller and easier project. Large blankets are more of a challenge—you either need to manage a vast number of stitches on your needles, or you need to knit the blanket in smaller pieces and then sew it together. I went with the latter option. The pattern is from Tin Can Knits by Emily Wessel. It’s a square with a symmetrical, almost floral pattern that you knit in the round from the centre, spiralling outwards. You can knit it as a single colour or with a contrast colour as the border. Despite its intricate appearance, it is dead easy to do (provided you keep track of your stitch count and which row you’re on!). To keep our promise of unlimited, free photo sharing and storage, we ask our customers to make at least one purchase every 12 months. To keep your Snapfish account open, please place an order by October 14. Look, Snapfish, I completely acknowledge you are within your rights to terminate my account, at any time, for whatever reason you wish. It’s your business model; if you want to burn it to the ground, you are free to do so. The Internet isn’t going to stand in your way: we’ll watch and warm our hands on the flames. You can tell me when it’s over if the high was worth the pain. As I write this, I’m very sore, because I spent several hours last night dancing. I had the privilege and honour of not just attending the wedding of my friend Cassie but of being in her bridal party. I’m starting to get the hang of this wedding thing, I think. Cassie is one of my oldest and bestest friends. Although there was a lapse during our childhood after I moved across town, we reconnected at the end of high school. Ironically, I’ve had no problem keeping in touch with her across the vaster distances between here and Ottawa, where she did an undergrad and now slaves away at grad school. I don’t envy her!